Kotaku is reporting that Japanese game magazine Famitsu recently published information on the upcoming Special Edition of Metal Gear Solid 4: Guns of the Patriots. According to this scan from Japanese magazine Famitsu, the regular version of Metal Gear Solid 4 will retail for Â¥8,800 (US $91), the Special Edition will go for Â¥9,800 ($101) and the bundle will go for Â¥51,800 ($534). And the color of the PS3 console in that special edition MGS4 bundle? That would be "steel." Fitting. 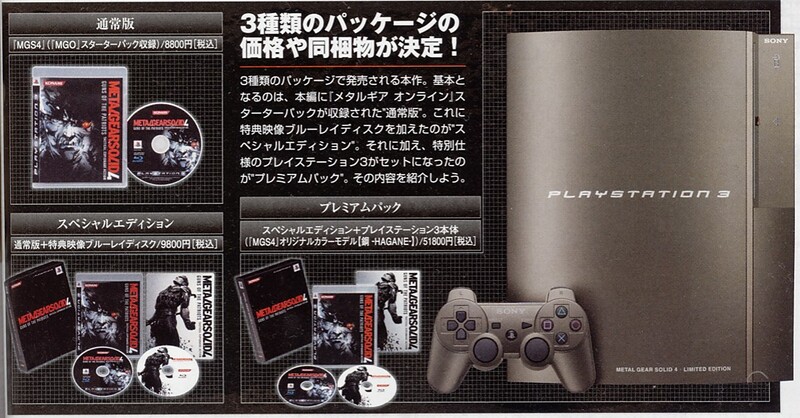 According to PS3 Fanboy the bonus DVD included with the Special Edition is "MGS Saga". No word yet on whether or not the Special Edition will release in North America, Europe or Australia.... View this article on the News Page.